Death Transfers of Minnesota Cemetery Lots is achieved under Minnesota law like no other probate transfer. And the field, and the cave that is therein, were made sure unto Abraham for a possession of a burying place by the sons of Heth. The limited right to make a testamentary transfer of the cemetery lot to another individual, or to the public cemetery association or private cemetery in trust – for the use and benefit of any person or persons designated in the Will. The permitted disposition of a Minnesota cemetery lot upon the death of its registered owner – Death Transfers of Minnesota Cemetery Lots – is contrary to many of the normal assumptions and procedures that would be familiar to a Minnesota probate attorney. The Magna Carta of Death Transfers of Minnesota Cemetery Lots, is found in M.S., Section 525.14 – Descent of Cemetery Lot. However, the provisions of M.S., Section 525.14 are often loosely identified as the rules of intestacy with respect to the rights in a Minnesota cemetery lot which are to be transferred upon the death of its registered owner. providing that the proposed distribution of the Minnesota cemetery lot was not to a “qualified person”. 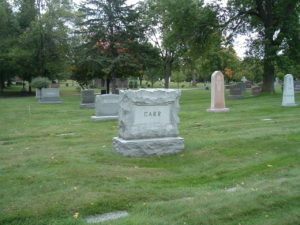 Therefore, the provisions of M.S., Section 525.14 are more properly identified as the rules of descent with respect to the rights in a Minnesota cemetery lot which are to be transferred upon the death of its registered owner – if they are not properly transferred pursuant to the terms of the decedent’s Will. various references in the statute to cemetery association, and private cemetery. A crypt or group of crypts or burial vaults owned by one person in a public or community mausoleum shall be deemed a cemetery lot. Grave markers, monuments, memorials and all structures lawfully installed or erected on any cemetery lot or burial plot shall be deemed to be a part of and shall descend with the lot or plot. to the cemetery association or private cemetery, as the case may be, in trust for the use and benefit of any person or persons designated in the will. limited by it to one particular person. The requirement that the testamentary devise of a Minnesota cemetery lot be limited to a person specifically mentioned in the Will precludes any valid Death Transfers of Minnesota Cemetery Lots pursuant to any residuary clause in the Will. who are specifically identified in the Will as the potential recipients of the right to be buried in the cemetery lot. a relative of the owner by blood or marriage. Presumably the rules of the public cemetery association or private cemetery association would determine the qualifications for any such relative of the owner of the cemetery lot. The registered owner of a Minnesota cemetery lot may make Death Transfers of Minnesota Cemetery Lots to the public cemetery association or private cemetery in trust – for the use and benefit of any person or persons designated in the Will. An owner of a cemetery lot may, while living, convey the lot to the cemetery association or the private cemetery in trust for the use and benefit of a person named in the trust conveyance. The conveyance may contain conditions, provisions, and covenants as the parties agree upon. Presumably, the Minnesota statutes allow the identification in the decedent’s Will of more than one potential user of a cemetery lot which is to be held in trust by the cemetery association, because such Will may be made many years prior to the death of the decedent, and allowance is made for the deaths of one or more designated users of the cemetery lot during the lifetime of the decedent. The cemetery association or private cemetery may, instead of deeding the fee title to this lot, grant only the exclusive right of interment in the lot. of any right, title, or interest in or to the lot contrary to the conditions and reservations of this section is void. Every cemetery association, or private cemetery, as the case may be, shall keep a record of all deeds, conveyances, judgments, decrees, or other documents affecting the title to lots in the cemetery. should be filed with the public cemetery association or private cemetery – in order that the public cemetery association or private cemetery can update its ownership records. Minnesota cemetery lots should be identified as items of real property in any probate court Inventory, Final Account, and Decree of Distribution documents. The Inventory and Final Account values of a Minnesota cemetery lot should be available from the records of the public cemetery association or private cemetery. Each Minnesota cemetery lot which is an estate asset should be identified in the Inventory, Final Account, and Decree of Distribution by its own legal description, as identified in the records of the public cemetery association or private cemetery. Assignment section of the Decree of Distribution. the Assignment section of the Decree of Distribution should assign the Minnesota cemetery lot(s) to the person who would take the Minnesota cemetery lot(s) pursuant to the provisions of M.S., Section 525.14.